A successful fundraising event can generate buzz, raise money and attract new donors, but they can be time-consuming affairs with a lot of moving pieces. You have the cause, idea, and enthusiasm to run a fundraising event, but without the right tools, your planning can be much more difficult than it has to be. With the right software, you can streamline the process and increase your odds of success. While great events require tons of planning and hard work, the potential benefits far outweigh the cons. Here are seven ways event software can save you time while also keeping you sane. Gone are the days of having to shuffle through paper to find an attendee, and collecting participants’ personal information at the registration table. With software, you can allow attendees to pre-register for an event while collecting all their information in one central, easy-to-access location. Software lets you track in real time how many people plan to attend your event. This makes planning the event that much simpler. Collecting participant information ahead of time streamlines the registration process so you can focus on other efforts needed to make your fundraising event flow smoothly. With the right fundraising software, you can add custom questions to your event registration page. In addition to collecting basic contact information (first name, last name, email address, home address) you can ask custom questions such as, “What program are you most interested in?” to use in future targeted promotions. Just a few pieces of personal information can help make future correspondence with a donor more meaningful. For example, when you send a follow-up email thanking them for participating in your event, you can personalize your message by referencing something they are passionate about. This will also allow you to build a relationship with these current donors in hopes of converting them into recurring donors. Everyone loves a good bargain. In fact, eMarketer found that 55 percent of U.S. Internet users will redeem a digital coupon or discount code at least once per year. Social impact organizations can also leverage the urgency that a discount code creates. By advertising a limited time offer, you can encourage donors to act quickly and use the discount code before it expires. With a discount code, you can encourage event participation by promoting an opportunity for participants to save. The right fundraising software can make it easy for you to add a discount code on your event checkout page. Maps and directions are a crucial part of any event. Some organizations provide directions via pamphlets, but these can get easily lost and may be difficult to follow. Make attending your fundraising event that much easier by providing detailed maps and directions online. By housing this information on your event registration page, attendees can easily access this information from anywhere. 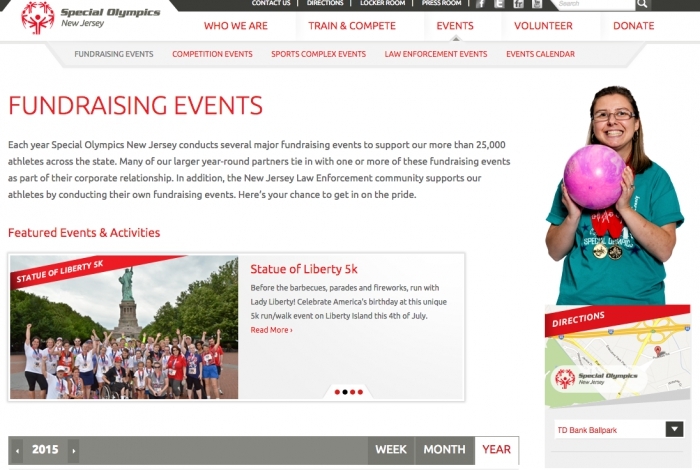 Special Olympics New Jersey created a customized widget for their fundraising events page that allows users to select the specific event location from a drop down menu. Once the event location is selected, a new map and set of directions appears. When you use mobile-friendly interfaces, you allow attendees to sign up, fundraise, and donate to your event, straight from their mobile devices. The Pew Research Center found 34 percent of cell Internet users go online mostly using their phones rather than a desktop or laptop computer. If your fundraising event page is not optimized for a mobile device, you may be missing out on a large pool of potential participants and donors. Another benefit of having a mobile-optimized event page is the ability to process payments right on the spot. These days, people are less likely to carry their checkbooks, so make it easy for them to donate straight from their mobile devices, wherever they are. Social media is a tried and true way for nonprofit organizations to gain new advocates and to share their events. A recent study by Social Media Today found that 78 percent of event organizers plan to increase their use of social media in the future. 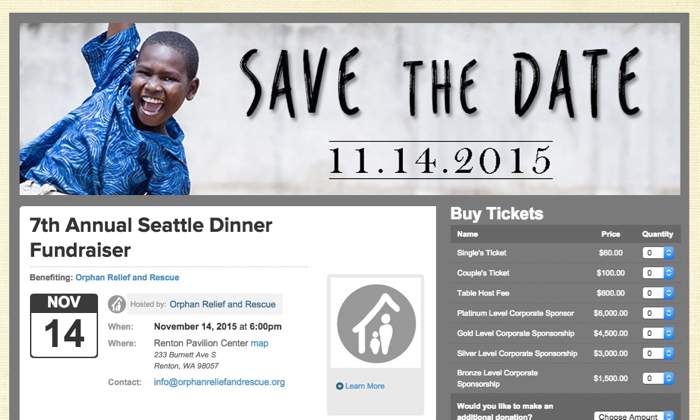 You can take your campaign to the next level by providing social share buttons on your fundraising event page. By giving your donors the ability to share their donation or event participation with their personal online network, you can increase your reach and generate more buzz around your event. Add social share capabilities, and you can empower your most passionate evangelists to promote your organization and drive more traffic to your fundraising pages. SocialTimes found that adding social sharing buttons to email messages an increase click-through rates by more than 150 percent. 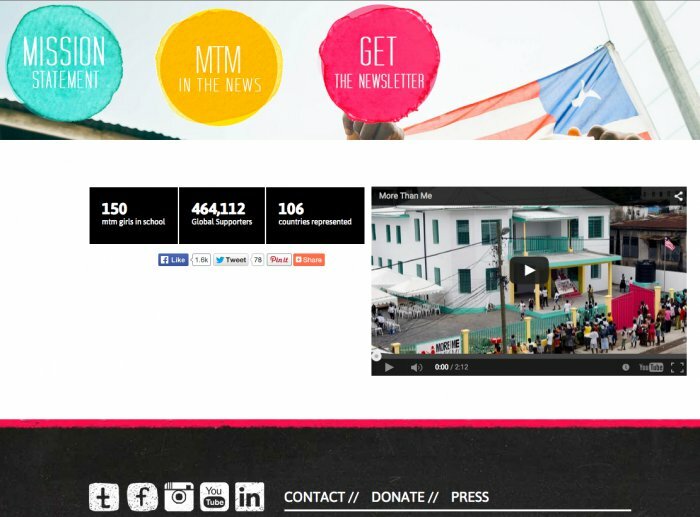 More Than Me, a non profit organization aimed at getting girls off the street and into school in Liberia, West Africa, added social share icons on their homepage. Supporters are able to share More Than Me’s mission with their social network, which over a thousand people have already done. With online Peer-to-Peer fundraising capabilities, your participants have the option to turn your event into their own personal campaign while raising money for your cause. With combined registration and fundraising, you can empower supporters to fundraise in addition to paying a registration fee. This allows you to maximize donations and acquire new donors. Reach expands tremendously using peer-to-peer fundraising online, touching far more people than you might through traditional fundraising efforts. Peer-to-peer fundraising opens up the pool of donors beyond just the people who registered for the event. There are opportunities to get many small donations as opposed to a few large donations. By allowing supporters to fundraise for your cause, you enable them to raise much more money than they may be able to give from their own pocket. This empowers them to help you maximize your revenue, rather than relying on registration fees alone. 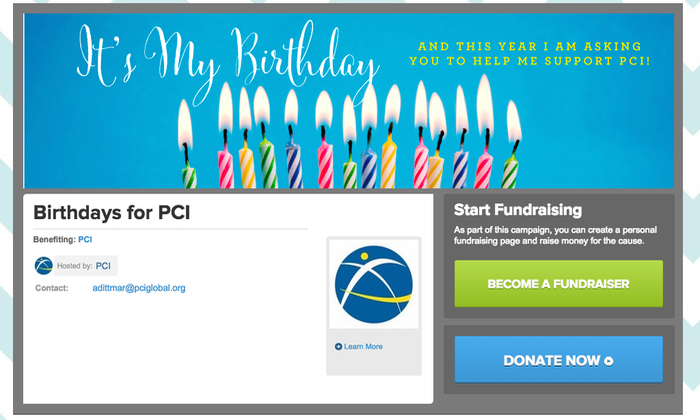 Project Concern International (PCI) allows individual fundraisers to create peer-to-peer campaigns to raise money for birthdays in lieu of presents. This is just one creative way to leverage peer-to-peer fundraising software to spread the word about your cause. Other organizations allow fundraisers the option to raise money instead of gifts for their anniversary, wedding, and baby showers. Whether you’re looking to build hype, attract new donors, are raise more money, investing in fundraising software can greatly help. A simple investment could yield monumental results.